Whatever partakes of God is safe in God. All that could perish of Saint Swithun, being enshrined within this place and throughout many ages hallowed by the veneration and honoured by the gifts of faithful pilgrims from many lands, was by a later age destroyed. None could destroy his glory. The monument itself evokes an absence: beneath the cloth hanging are bare ribs of metal, as of a skeleton stripped of its flesh. 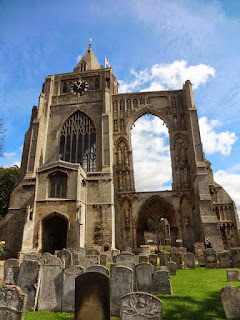 Swithun was a very popular saint in medieval England, and his shrine, moved at various times as the cathedral was rebuilt and reordered, was the destination of many pilgrims' journeys. 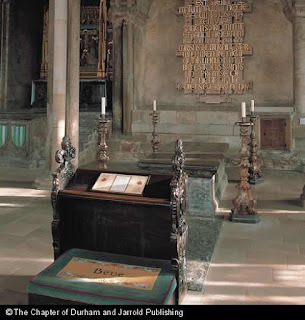 At three o'clock in the morning of 21 September 1538, his shrine was demolished by the Commissioners of Henry VIII, who recorded their intention to 'sweep away all the rotten bones' they found within - bones which had for more than five hundred years been venerated as treasures. Ælfric tells us that the Anglo-Saxon minster at Winchester, which housed the original shrine of St Swithun, 'was hung all round with the crutches and stools of cripples who had been healed there, from one end to the other on either wall - and even so they could not put half of them up'. No such offerings can be found in Winchester today, but modern pilgrims leave tokens of their presence nonetheless: votive candles, whose flames glow in the reflection of the shrine. This is the season of All Saints, Hallowtide, and it seems a fitting time to post a collection of pictures on a theme I've been interested in for a while: how English cathedrals and major churches today choose to represent their pre-Reformation history, and especially the history of the medieval saints whose shrines they once housed. 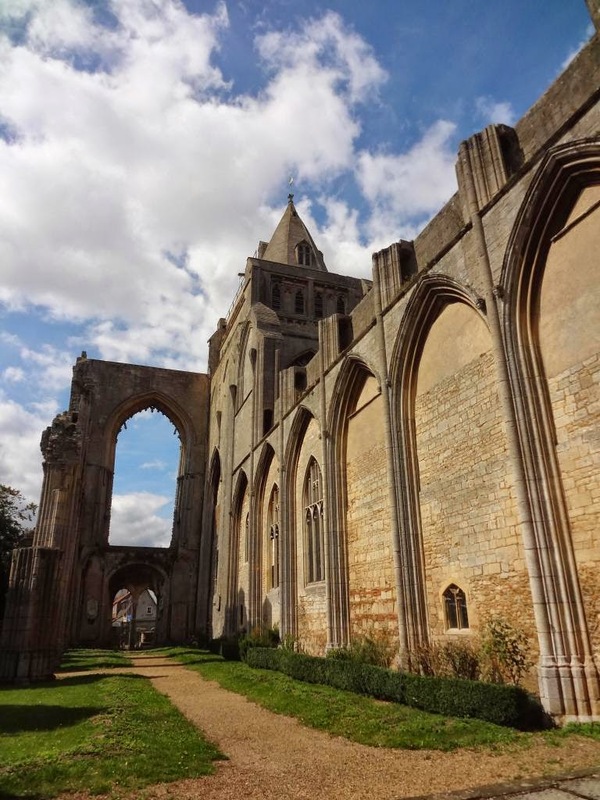 In the Middle Ages, these shrines were integral to the life, history, and physical shape of these cathedrals, a tangible embodiment (in every sense) of their shared spiritual life and their collective identity as a community. 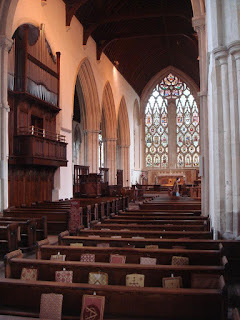 As at Winchester, these shrines were usually in a prominent and central position in the church, close to the high altar, and the history of most cathedrals was inextricably bound up with the saints whose relics they preserved, who might be their founders, early leaders, or the nucleus around which the community originally grew. The saint was both literally and metaphorically at the heart of the cathedral, and to remove them created a huge gap. When these shrines were destroyed, it left an absence in more ways than the loss of the saint's holy 'rotten bones'. A number of churches today choose to acknowledge and commemorate that absence, and I'm interested in the different ways they find to do that. 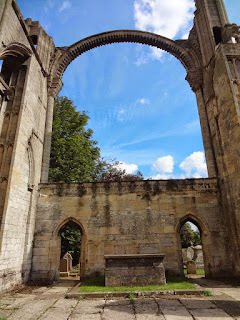 This post is a brief journey through the shrines of some of England's medieval saints - or rather, the empty spaces which those shrines once occupied. Some of these churches are among the oldest surviving institutions in England, with more than a thousand years of tumultuous, yet essentially unbroken continuity, and their saints and their medieval history of pilgrimage are an unavoidable part of their story - unless they are prepared to ignore the first six or seven centuries of their history, and often their own foundation-story, these churches have to find some way of telling that story to visitors. But they don't have to do it with such eloquent generosity to the medieval past as that monument at Winchester does, and the choices they make are interesting. If space is given over to an absence, in the middle of a busy and crowded church, it becomes significant how that space is identified and used. My aim in this post is to illustrate some of the varied ways in which different churches choose to mark out that empty space - with a replica shrine, a plaque, or simply an area left clear - as well as how they encourage their visitors to approach and interact with it. Do they treat it primarily as an architectural feature, as a historical curiosity, or as a place for prayer? It's surprising, perhaps, how often the third of those options is the case; these churches are, of course, all Anglican cathedrals, which makes it all the more remarkable that they (and their visitors and worshippers) are prepared to embrace these relics of medieval Catholic devotion. They don't always call them 'shrines' - is something like that monument to Swithun a shrine itself, or a memorial to a lost shrine? - but it seems a fine line to me between commemorating the shrine and effectively recreating it. What is clear in all cases, though, is that these saints still matter to the churches which once housed their shrines. They are still a part of the stories these places tell about their own history and identity - not in the ways they would have been in the Middle Ages, but nonetheless in ways which are meaningful and significant both to the churches and to those who visit them. One thing which surprised me at many of these shrines, again and again, was how many votive candles had been left burning beside them by visitors who had been there before me. As a medievalist, I get to hear a great deal about how weird and alien medieval devotion to saints and shrines is to a 'modern audience', but these churches and their visitors seem to feel differently - and that might be worth bearing in mind next time you hear someone holding forth about medieval 'superstition'. Even if they do not subscribe to medieval (or modern) Catholic beliefs about saints and their relics, many of these churches are generous enough to acknowledge that there is something special about a place which was the destination of so many pilgrims' journeys, as if once the shrine itself is gone the thousands of prayers can hallow even the empty air. 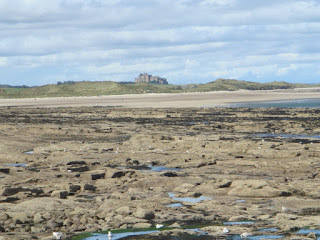 After Cuthbert the 'List of Saints' Resting Places' tells us about its next great Northumbrian saint: Þonne resteð Sancte Oswald cyninge on bebban byrig wið þa sæ, 7 his heafod resteð mid Sancte Cuðberhte 7 his swyðra earm is nu on bebban byrig ('St Oswald the king rests at Bamburgh beside the sea, and his head rests with St Cuthbert, and his right arm is now at Bamburgh'). 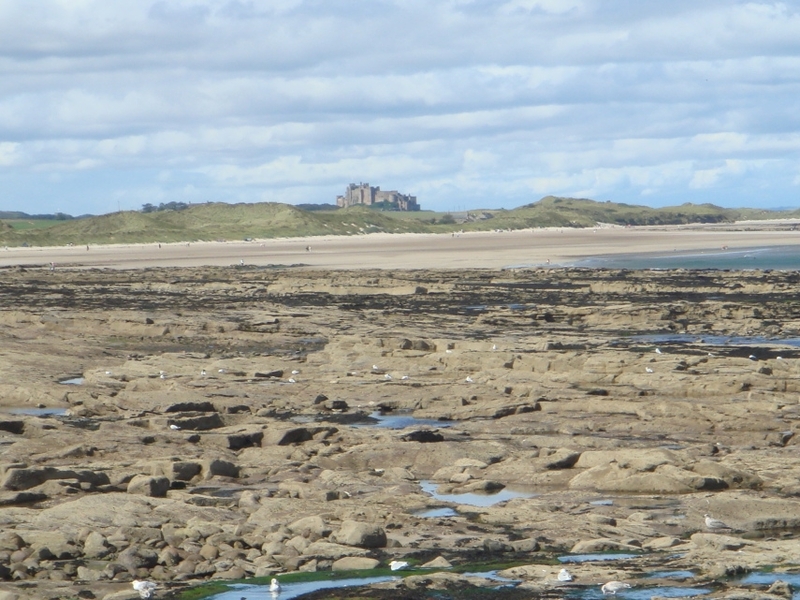 St Oswald, who died in 642, was a very popular saint, and in the Middle Ages his relics were dispersed between a number of churches: his head was buried with St Cuthbert, and other relics could be found in Gloucester, Peterborough, and at Bamburgh 'beside the sea'. Moving further south, down to Lindsey, Lincoln Cathedral has an interesting combination of the medieval and the modern. Lincoln was not a cathedral in the Anglo-Saxon period, so its chief saints are from slightly later: the twelfth-century bishop St Hugh is now the most famous, and part of his medieval shrine survives (on the left of this picture, at the east end of the cathedral). Next to the shrine, the cathedral reserves an area for prayer which houses not just votive candles but some unusual modern candle-holders, known as the 'Gilbert Pots' in honour of St Gilbert of Sempringham - twelfth-century founder of the Gilbertines, Lincolnshire's very own religious order. Now for Mercia, and the example which first got me interested in the idea for this post: Lichfield Cathedral, which places its Anglo-Saxon saint front and centre. The sign on the left is information about the shrine of St Chad, on the right a prayer for recent victims of terrorist attacks in London - a striking juxtaposition of the medieval and modern. Modern cathedral visitors like going up and down stairs as much as medieval pilgrims did - crypts and upper chapels feature several times in this collection, as spaces set apart (then and now) as special and self-contained areas for prayer. Lichfield has some particular advantages in presenting its medieval past to visitors. This is the wonderful 'Lichfield Angel', discovered under the floor of the cathedral in 2003, which may have formed part of the Anglo-Saxon shrine of St Chad. It probably dates to around 800, and is now displayed next to the St Chad Gospels, a beautifully decorated Anglo-Saxon manuscript which has been at Lichfield since at least the eleventh century. These are two remarkable treasures for a cathedral to have, and they are displayed in an accessible and informative way which puts Chad and his shrine in their historical context. Visiting this summer, I was interested to see how Chad has become integrated into the recent growth of interest in Anglo-Saxon Mercia, sparked partly by the discovery of the Staffordshire Hoard in 2009. Lichfield Cathedral is now part of the Mercian Trail, which also incorporates the museums displaying the hoard and Tamworth Castle, all of which provide vivid glimpses into the early history of Mercia. Tourism and pilgrimage have always gone hand-in-hand, and clearly Chad's shrine is now part of a new focus for the heritage industry in this area - it's a fascinating example of how a discovery like the Staffordshire Hoard can provide an impetus for re-imagining how an unfamiliar period of history can be presented to the public. But the prayers and candles at Chad's shrine show this is not 'just' heritage - the visitor is encouraged to reflect on something more. This small, atmospheric space is left dark and unadorned, and here the candles suggest a shrine, without quite attempting to reconstruct one. 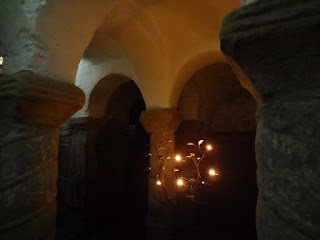 They are a reminder that this little crypt is not just an amazing architectural survival, but a holy space - in some ways, the closest one can come to visiting the semi-underground kind of arrangement which we know some early medieval shrines had. This is, as you may have guessed, my own preferred attitude to medieval pilgrimage - to recognise the humanity of those who sought out these shrines, and to treat them not as ignorant superstitious dupes but as people with explicable needs and desires, different from our own, but not beyond our comprehension. Ouch! (How I hate that snotty use of 'curious', which so often comes from people who are resolutely incurious about customs they are determined not to understand...) It probably won't surprise you to learn that I'm inclined to think this attitude - more the tone than the content - is both over-simplified and quite disrespectful to the people who built this great cathedral, but I'm actually surprised it isn't more widely represented in what are, after all, Anglican churches. It is also, however, deeply ironic, because just a few feet away from this condemnation of saints and shrines is... an impromptu shrine. This is the tomb of Katherine of Aragon, and here people leave pomegranates as offerings (?) to the queen. She's not a saint, but people do love a mistreated princess. Is this more or less 'superstitious' than venerating the relics of St Oswald? Squash out and sneer at relic-veneration all you like, people will just make themselves new saints and new rituals. This is a tapestry based on an image from the fifteenth-century manuscript BL Harley 2278, a lavishly illustrated manuscript of Lydgate's Life of St Edmund. 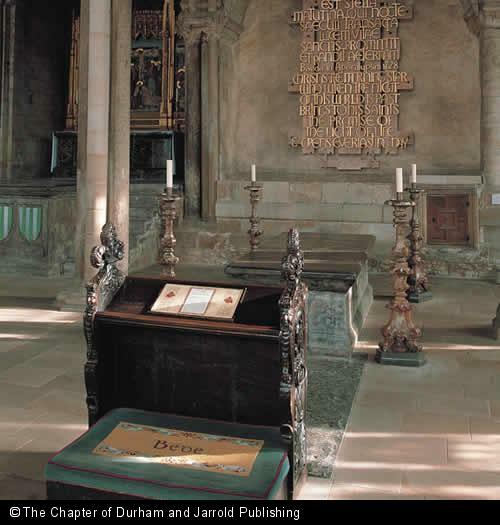 It shows Henry VI praying at Edmund's golden shrine - a reminder of what once stood where the grass now grows. This is a reconstruction of Julian's cell, which was destroyed by bombing. When Julian of Norwich was an anchoress here we know that people came to seek her out, but that was because they wanted the wisdom of the living woman - not to make pilgrimage to a saint. No one in the Middle Ages would have brought offerings or lit candles at Julian's shrine, but since the twentieth century pilgrims have been doing those things in this little suburban church. They buy hazelnuts, as pilgrim tokens. The little candle is dwarfed by the space, and it's a powerful memorial. All this part of the cathedral was rebuilt to house St Thomas' shrine - the pillars are red marble as an allusion to his holy blood, and all the windows (treasures of thirteenth-century art) depict his miracles. Those windows tell lively stories of people from all classes who sought out the shrine of St Thomas for healing and help, but the shrine to which they came is gone. As you can see, visitors are encouraged to light candles and take prayer cards here, and there's a beautiful statue made in 1982. It's a wonderfully quiet space in the middle of a cathedral almost always full of tourists ('from every shire's end...'). One thing I do find odd about Canterbury Cathedral, though, is how much Thomas Becket overshadows its other saints - the Anglo-Saxon archbishops Dunstan and Alphege had shrines near the high altar too, but you can't find those sites unless you're specifically looking for them. St Anselm has a chapel, but there are no prayer cards or candles for him. An interesting choice of priorities, reflecting which saints are popular today (and in the late Middle Ages) rather than at other possible points in Canterbury's 1400-year history. St Augustine of Canterbury, his sainted fellow-missionaries, King Ethelbert, and Bertha of Kent were all buried here, but only concrete blocks mark out the sites of their tombs. English Heritage do an excellent job presenting the history of this church to the public, but of course it's an archaeological and historical site - not anything close to a shrine. Though it's obvious why they don't encourage visitors to interact with this site in the same way the cathedrals do, it's important to remember that this was once a place of devotion and pilgrimage, just as Canterbury Cathedral was or any of the other churches in this post. The difference between them today is an accident of history, more than anything else. 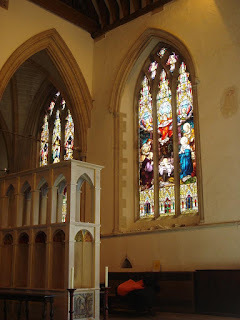 As an additional note: a shrine to St Augustine has recently been built, along medieval lines, in the church in Ramsgate which is 'England’s newest shrine recalling England’s first missionary': here's a picture. 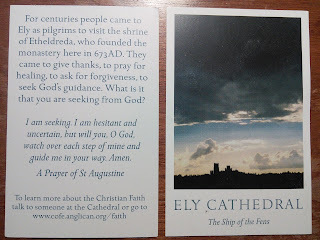 From Kent into Sussex, and Chichester Cathedral. Above is the site of the shrine of St Richard of Chichester, bishop here in the thirteenth century. It's behind the high altar, and the cathedral website provides a useful guide to the mixture of modern art and medieval devotion here. 'The Shrine of St Richard in Chichester was considered by many to be the third most important in the land after St Thomas in Canterbury and the Virgin Mary at Walsingham, so brought pilgrims to both the city and the cathedral. 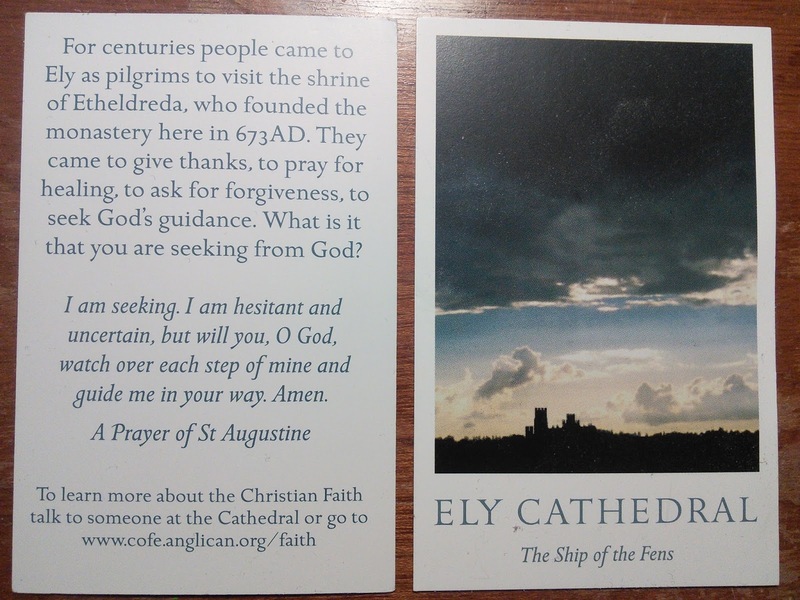 The gifts they brought to the shrine provided the funds that largely ran the cathedral and enabled refurbishment in those times, as do the gifts of visitors today', it says (a more fair-minded way of talking about pilgrimage-as-fundraising than you sometimes see!). 'The modern area is a raised platform with a Purbeck marble altar designed by Robert Potter in 1984... Behind the altar is a tapestry screen designed by the German artist Ursula Benker-Schirmer in 1985.' 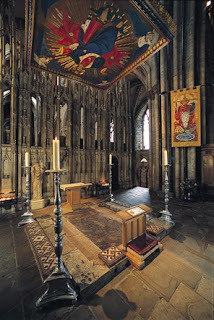 The tapestry illustrates some of the miracles of St Richard. And indeed they are, in large numbers - each one the flame of a prayer, or an individual's thought. 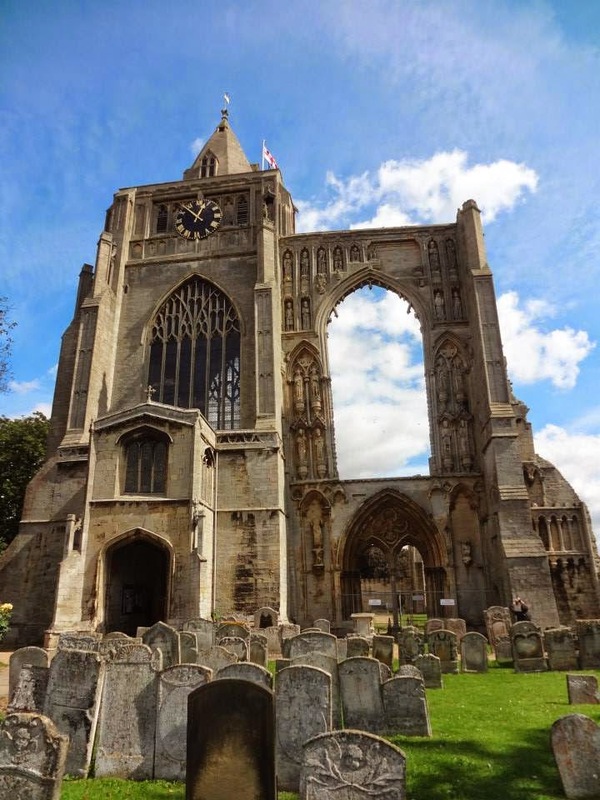 They also have (or did when I was there last year; I don't know if it's permanent) a fantastic exhibition on the medieval history of the cathedral, including images of manuscripts produced at the monastery, quotations from Old English texts and reflections on Anglo-Saxon spirituality. But no 'shrine' as such. (You'd really think I would have a picture of this in daytime, but apparently I don't!) 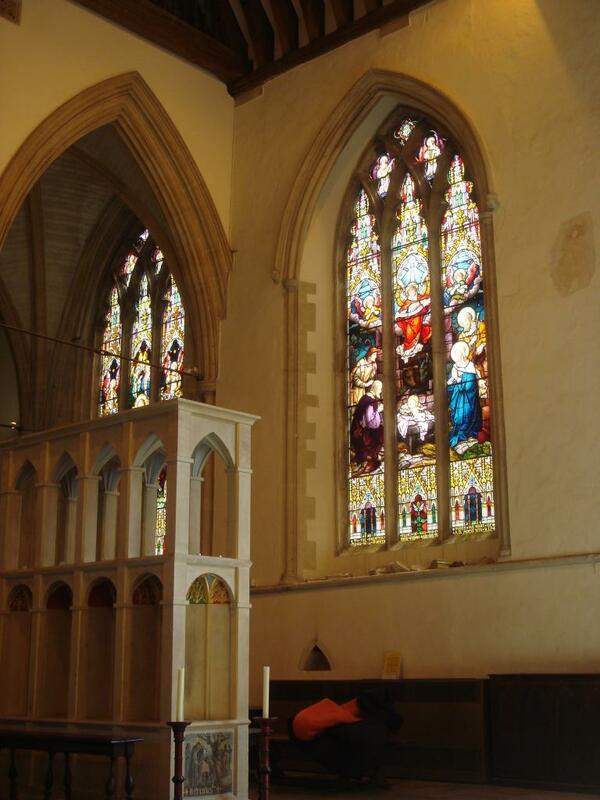 This chapel is in the north-east corner of the cathedral, and is frequently used a site for modern art inspired by Frideswide's story - it also has a Burne-Jones window showing Frideswide's life in vivid colour. The inscription reads 'The fragments of the Shrine of Birinus, first Bishop of Dorchester, set in this cross, were given by Dorchester Abbey to commemorate the 1300th anniversary of the transfer of the See of Wessex from Dorchester to Winchester, 1979'. The shrine itself has become a relic. In some ways these pictures speak for themselves, but I'll just say a few things in closing. Firstly, I think all this is admirable and worthy of praise; I complain every now and then about negative portrayals of medieval religion, and there's no doubt that just dismissing medieval shrines as silly superstition is by far the easiest attitude to take. But these are all examples (and fairly recent examples, mostly from the past few decades) of churches engaging seriously and sensitively with their medieval history, and being open to seeing the good in it. They embrace saints as their founders or as significant figures in their history, and find them useful as a means of telling stories about their past. One reason I included the quotations from the 'List of Saints' Resting Places' is to make the point that these are ancient shrines - many of them date back to the seventh or eighth century, and in most cases the medieval history of these churches 'outweighs', in simple temporal measure, their post-Reformation history: some of them had been in existence for eight hundred years or more before the Reformation, which is only five hundred years ago. It's easy from a modern perception to elide all that time - it's all just the Dark Ages, isn't it? Just mud and darkness. But eight hundred years is a very long time. We are closer in time to the Reformation than sixteenth-century pilgrims were to the Anglo-Saxon saints whose relics they venerated, and that ought to put into perspective the modern tendency to assume everything 'medieval' is all just basically the same. And secondly, I admire the willingness of these churches to see and point out parallels between medieval pilgrims and their own twenty-first century visitors. It's so common to see medieval pilgrims treated as 'other', as stereotypes, as fools or dupes whose devotions deserve only to be joked about or cynically explained away. (All about greedy monks and money-raising, right?) This is a popular media perception, but these modern shrines - or memorials to shrines - suggest that many ordinary people do not find the practices of medieval devotion as utterly alien as this perception would suggest. Of course, modern visitors don't interact with shrines in the same ways medieval pilgrims did, and the absence of physical relics does make a big difference. But not perhaps as much as you might think. Who knows what the people who visit the shrines to St Chad or St Etheldreda or St Swithun think about when they light candles in these places? I wouldn't presume to guess. Many probably think of themselves as tourists, not as pilgrims, and light a candle as a nice thing to do; others do it with clear intention and particular prayers in mind. No one does it because they're expected to - it's entirely a personal choice. Are the hopes, desires, and fears which those candle flames represent really so different from those of medieval pilgrims, even if the beliefs which structure them have changed? There are now, as there were in the Middle Ages, a variety of ways for people to interact with these holy places, and the beliefs people bring to them vary. But the very fact that these spaces are made the focus of attention and reflection, and prayer, means that there is some kinship. In one sense these shrines are lost, destroyed - they are absences, as I began by saying. But they aren't actually empty; they are, to visitors today as in the Middle Ages, full of meaning.